The Pax gene family appears to have evolved by a combination of gene duplication and / or genome duplication events over a long period of evolutionary time. The highly conserved paired box sequence within the Pax genes encodes a paired DNA binding domain, indicating that the Pax proteins are transcription factors which bind and regulate downstream target genes. Nine Pax genes (Pax1 - Pax9) listed in the National Center for Biotechnology Information (NCBI) database, contain this motif. Some members of the Pax family, which includes Pax3 and Pax7, encode a second DNA binding domain of the paired-type homeodomain (HD) class. Pax3 and Pax7 are closely related paired box family members specifically expressed in the dorsal neural tube and the developing somites and in proliferating and migrating neural crest cells where they are implicated in early neural and myogenic development, and are required for development of specific myogenic, neurogenic and neural crest cell lineages. Pax3 and Pax7 genes are also found aberrantly expressed in tumors arising from these cell lineages. Identification of polymorphisms within or close to identified putative cis elements so as to provide markers for genome-wide association mapping studies to identify Rhabdomyosarcoma susceptibility loci of Homo sapiens The computational methodologies included but were not limited to systematic compilations of biological and computational results from various sources and evaluations of original experimental data with biocomputational tools and in vitro studies. 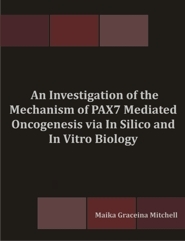 From our studies we identified a region in intron 8 of PAX7 that is also found in intron 23 of the NF-1 gene as well as in the alternative intron 10 of PAX3. This sequence appears to contain regulatory sequences that are conserved in all three genes and thus it seems probable that transcription factors and/or spliceosomess that bind to this region would act similarly on all three genes. Regions of LOH, usually arising as a result of either hemizygous deletion or gene conversion events, are typically defined as stretches of chromosomal areas where all heterozygous and thereby informative alleles are rendered homozygous in the cancer. This classical definition assumes that all data points are accurately identified and that all polymorphic alleles are mapped correctly within the genome. In this project we used in silico biology to identify additional polymorphic sites that may provide information on LOH in future studies. Interestingly there were no changes in SNP frequency observed in the ARMS samples relative to the expected allele frequency at the selected SNPs. Since only a few SNP sites were investigated in a very few samples for this thesis, additional SNP analysis at other identified sites may reveal significant changes in allele frequency and LOH in ARMS patients. As most developmental biology studies have been performed on mice, the mouse form of Pax will be used unless specifically referring to human in which case PAX will be used.